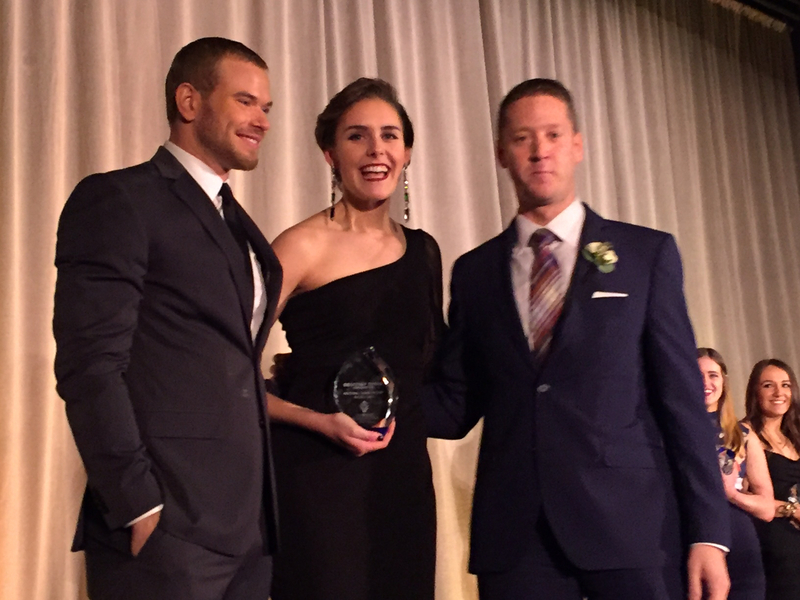 Vivian Cooper honored by actor and Geoffrey Beene brand ambassador Kellan Lutz (left) and Marc Mastronardi, EVP of business development at Macy’s. Philadelphia University fashion design senior Vivian Cooper was awarded the first-ever top award of $35,000 from a national pool of 600 student designers at the YMA Geoffrey Beene National Scholarship Awards Dinner in New York Jan. 12. Marc Mastronardi, executive vice president of business development at Macy’s, announced the unprecedented scholarship award for Cooper in front of a packed ballroom of 1,500 industry leaders, educators and students. Mastronardi, chair of the YMA Fashion Scholarship Fund committee, said she was the unanimous choice of the judges. A surprised Cooper, smiling broadly, accepted the award from Mastronardi and actor Kellan Lutz, who is Geoffrey Beene brand ambassador. At the scholarship dinner, one of the year’s top fashion industry events, Cooper was cheered on by a PhilaU contingent that included Sheila Connelly, fashion design program director; Nioka Wyatt, fashion merchandising and management program director; Michael Leonard, academic dean of the School of Design and Engineering and the David and Lillian Rea Chair of Design and Engineering; and Jesse Shafer, vice president for development and alumni affairs; as well as her parents. 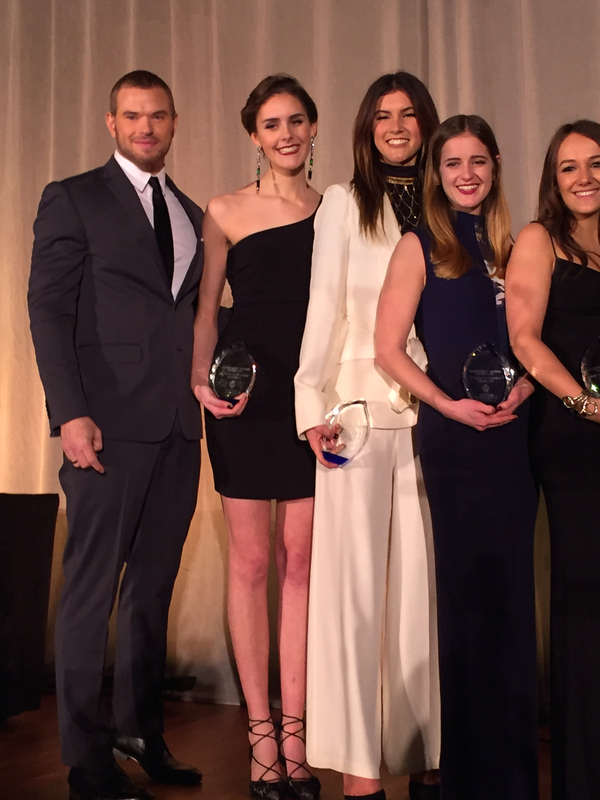 Vivian Cooper with Geoffrey Beene brand ambassador and actor Kellan Lutz and other YMA scholarship winners. Cooper and seven other YMA top finalists had to present to judges a project focused on the future of sustainability in the fashion industry. They were challenged to design a product for a mass retailer that adheres to the retailer’s sustainable business objectives while remaining consistent with the retail price of comparable products in the store. For her case study, Cooper created Full Circle, a private-label junior’s swim and beachwear line for Target made from recycled plastic bottles. Full Circle would partner with Repreve, a company that turns recycled plastics into fibers that can be used to create unique fabrics. In addition, the fashion line would engage communities to support sustainability through the Full Circle Movement. “The brand would get Target employees out into the communities and, in turn, invite communities to get involved in the bigger mission behind the line–which is to reduce pollution in our oceans,” Cooper said. In addition to Cooper, seven additional PhilaU students won YMA Fashion Scholarships of $5,000 each in this year’s competition, as previously announced: fashion design students Colton Snavely, Keren Espina, Maria Balestino and Emily DeBernardo and fashion merchandising students Nicole Braun, Zoe Wilson and Maddie Bill, who received the award for the third straight year. All the scholarship winners attended an internship fair and networking event with top industry officials on Jan. 13. The annual YMA Geoffrey Beene scholarship competition and its industry-based board provide an extraordinary network that encompasses every leading apparel company in New York, Connelly said. 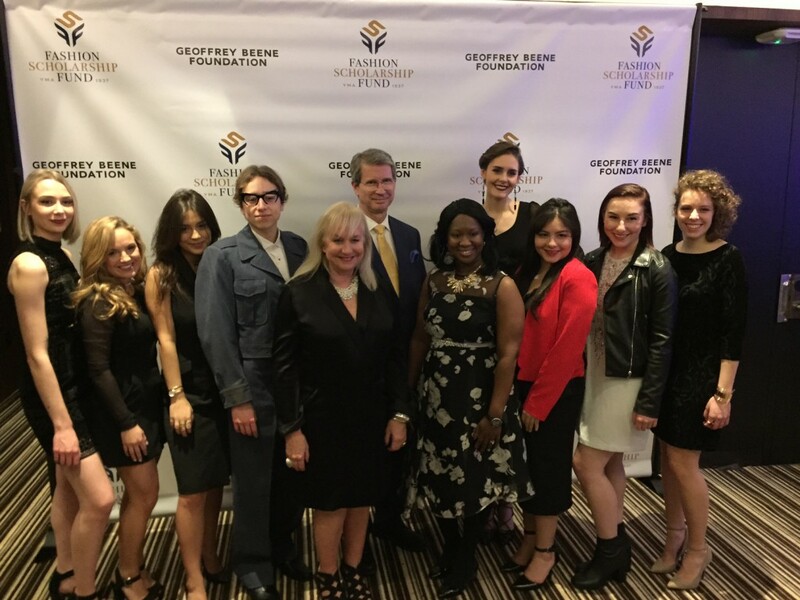 This year’s YMA competitors represented leading collegiate fashion, fashion merchandising and business programs; finalists along with Cooper included students from the University of Pennsylvania, Cornell University and the University of California at Los Angeles (UCLA). Cooper was selected to move on in the competition from an original pool of some 600 students from across the country. PhilaU fashion students historically have performed well in the YMA scholarship program. Fashion design alumna Tia Pion ’15 was a Geoffrey Beene National Scholarship finalist in 2015, and alumni Casey Saccomanno ’08 and Jessica Steele ’09 each won top honors. In addition, dozens of PhilaU students have received $5,000 and $10,000 scholarships in recent years. The YMA association, made up of fashion industry leaders, promotes education of the fashion arts and business through internships, mentorships and career programs. It awarded $1.3 million in student scholarships this year. In addition to the students, other honorees at the annual fashion gala included Michael Strahan, fashion entrepreneur and former NFL star; John Tighe, EVP and chief merchant of JCPenney; and Judy Person, EVP group president of Randa Accessories. In addition to Vivian Cooper’s $35,000 award, seven other PhilaU students received $5,000 scholarships. Pictured here: (l-r) Zoe Wilson, Nicole Braun, Maddie Bill, Colton Snavely, faculty members Sheila Connelly, Michael Leonard and Nioka Wyatt, Cooper, Keren Espina, Emily DeBernardo and Maria Balestino.